long-term future of all of the vehicles in the collection – and by the end of June clearance of the site was finally coming to an end. 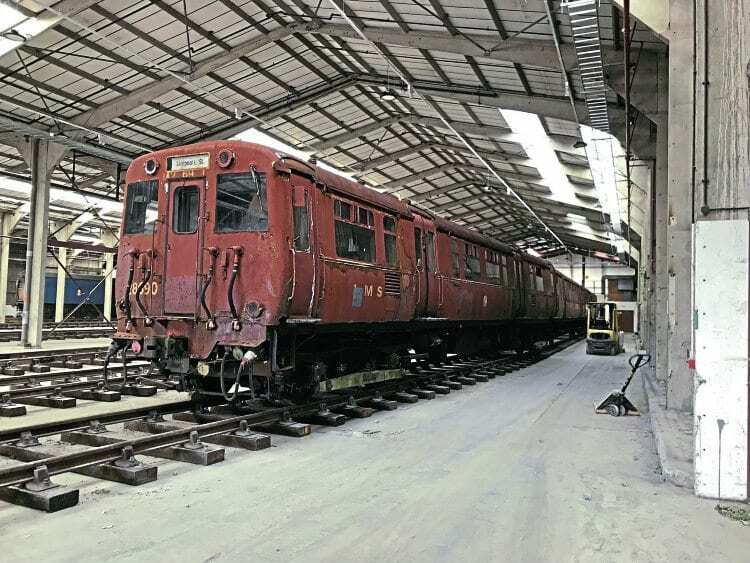 Among the last items remaining at the Coventry site were two of the museum’s key exhibits: the Southern 4-SUB and Merseyside Class 503 units. Assurance was given from the outset these historic units were safe, but only recently have details of their new home been announced. They are now in the Locomotive Storage Limited facility in Margate, Kent; safe, dry and secure, under cover for the first time in 30 years. Many will know this building as the former Tri-ang/Hornby factory warehouse, which continues to be the home of the Hornby Visitor Centre. The three-car Class 503 was the first unit to arrive at Margate, on May 30, before ‘A4’ class No. 4464 Bittern, followed by the four-car 4-SUB (Class 405) set No. 4732. The first car was delivered on June 7 and the last on June 18. Also, spare 2-EPB (Class 415) DTSO No. S15354S, from set No. 5176, has accompanied them and will be a donor vehicle for the 4-SUB.